Well it was time for Patty to get a new vehicle. Over the past year she has been trying to decide between a SUV and a pickup truck, finally settling on a truck. Saturday we stopped in at the dealership to have a look at the latest offerings by Toyota. Typical Saturday at a big dealership, we didn’t make it to the sidewalk much less the building before we were approached by a salesman, Mike. Patty told Mike we were interested in seeing some Tacomas to which Mike said they had sold all of their Tacomas but he could show us something else. Patty and I both knew he was joking, but unfortunately for Mike he did not know that we have been married over 30 years and can practically read each other’s minds. Simultaneously we replied “ok” and turn on our heels and headed back toward the jeep. The look on his face was priceless. Mike quickly recovered and assured us they had plenty of Tacomas to choose from. We walked to the Tacoma section of the dealership as Mike asked what we were looking for. We told him we were getting into camping/overlanding and would need 4 wheel drive and wanted a 4 door cab. With this information Mike was able to narrow our choices down to the Tacoma Sport or the Tacoma Off-Road. 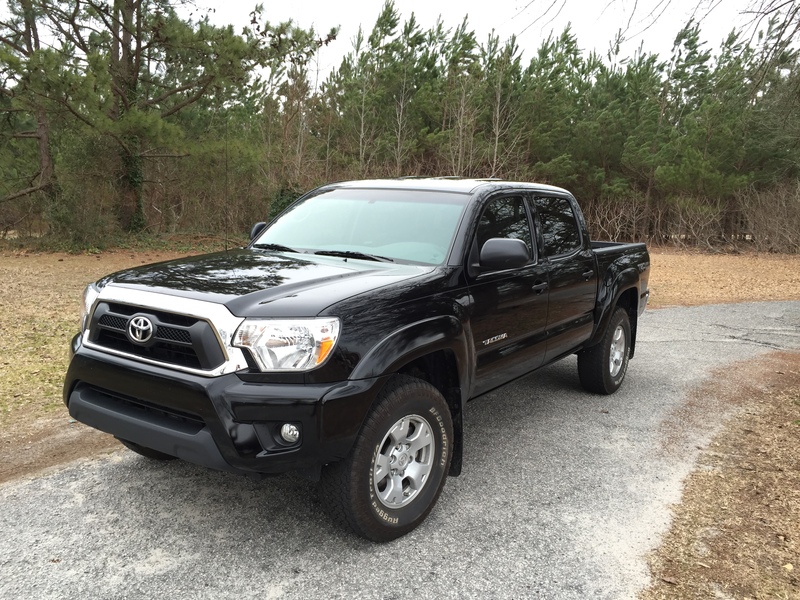 After looking both trucks over Patty decided on a black 2015 Tacoma Off-Road Edition. After enduring a couple of hours of hard selling attempts on accessories and warranties we finally signed the papers and drove off the lot with Patty’s new truck.